This report examines the ‘Global Sarcopenia Treatment Market’ for the period 2018–2026. The primary objective of the report is to offer updates and information related to market opportunities in the global sarcopenia treatment market. This report covers the global sarcopenia treatment market performance in terms of revenue contribution from various segments. The report begins with an overview and definitions. 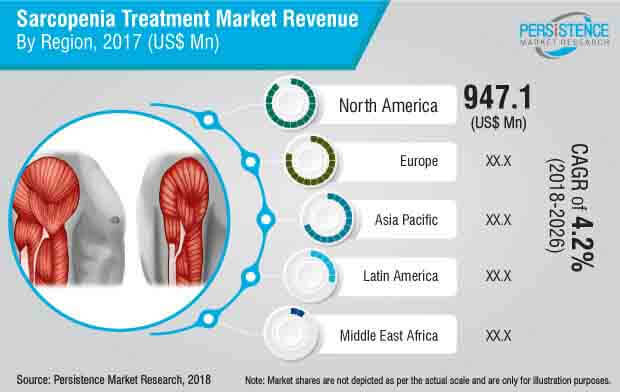 The market viewpoints section underlines macro-economic factors influencing the growth of the global sarcopenia treatment market along with detailed opportunity analysis of the market. This is then followed by the key drivers, restraints and trends of the global sarcopenia treatment market. The global sarcopenia treatment market is segmented based on treatment type, distribution channel and regions. Based on treatment type, the global sarcopenia treatment market is segmented into protein supplement, vitamin B12 supplement, and vitamin D & calcium supplement. Based on distribution channels, the global sarcopenia treatment market is segmented into hospital pharmacies, retail pharmacies, online pharmacies and hypermarket & supermarket. Geographically, the global sarcopenia treatment market is segmented into North America (the U.S. & Canada), Latin America (Brazil, Mexico and Rest of Latin America), Europe (Germany, France, the U.K., Italy, Spain, Russia and Rest of Europe), Asia Pacific (India, Australia, Japan, China and Rest of Asia Pacific), and Middle-East and Africa (GCC Countries, South Africa and Rest of MEA). A detailed analysis has been provided for each region in terms of market size, Y-o-Y growth rate, absolute $ opportunity, and market attractive index. The forecast of the sarcopenia treatment market by country, treatment type, and distribution channel is represented in a tabular form for each region. This section will help to understand the present scenario and opportunities of the sarcopenia treatment market in major countries by each segment. In the next section of the report, the ‘Competitive Landscape’ is included to provide the report audiences with a dashboard view of the key competitor firms in order to access the key differentiators among the competitor firms. This section is primarily designed to provide clients with an objective and detailed comparative assessment of product offerings and strategies of key providers specific to a market segment. The detailed profiles of players operating in the sarcopenia treatment market are also provided in the report, which highlight company description, product/segment overview, SWOT analysis, financial information, key developments related to market and strategic overview. The next section of the report highlights the market outlook for 2018–2026 and sets the forecast within the context of the sarcopenia treatment market by region. A detailed analysis has been provided for each region in terms of market size, Y-o-Y growth rate, absolute $ opportunity, and market attractive index. The above sections – by treatment type and distribution channel – evaluate the historic market analysis and growth prospects of the sarcopenia treatment market for the period 2018–2026. We have considered 2017 as the base year and provided data for the forecast period. The final section of the report represents the global scenario of the sarcopenia treatment market along with y-o-y growth and market forecast till 2026. This section also evaluates the global market opportunity over the forecast period as well as the absolute dollar opportunity for each year. This section will help to understand the overall growth of the sarcopenia treatment market and the opportunity analysis for every year over the forecast period. To arrive at the market size, bottom-up approach is used to validate the total market size obtained for the sarcopenia treatment market. The forecast presented in the report provides total revenue of the sarcopenia treatment market over 2018–2026. Triangulation methodology is used for market estimation that is primarily based on experimental techniques, such as patient-level data to obtain precise market estimations for sarcopenia treatment market and insights on specific country/regions. The country-specific data is again analyzed to derive data at a regional level and then at the global level. This methodology ensures high quality and accuracy of information. The factors considered while developing the estimates of the sarcopenia treatment market prevalence of sarcopenia, available treatment options for sarcopenia, adoption of supplements for sarcopenia treatment, and prescription pattern for different supplements. The average selling price (US$) is derived by using weighted average pricing methodology. The market value has also analyzed by considering the revenue from the key players operating in a segment. The key players are segmented at the tier level with respect to their revenue, product portfolio and geographical presence. This process involves analysis of various annual reports of companies, investor presentations, SEC filings, 10k reports, earning call transcripts and press releases. This task is done to fetch substantial information about the key players, their respective revenues and estimate their respective market share. Revenue growth of the key market players is analyzed over the historical period and market share of key players has been made in order to validate and align the resultant market numbers. The market structure is closely studied and analyzed at the regional level to map and ascertain incremental $ opportunity for companies, for instance, supply from domestic/regional players, small-scale enterprises or unorganized segments is also taken into consideration to arrive at the final market numbers. While forecasting the size of the sarcopenia treatment market, we have considered the impact of several factors such as per capital healthcare expenditure, disposable income, launch of new dietary and nutritional supplement brands and products, average consumption of different supplement among elderly across all regions, etc. However, quantifying the market across the aforementioned segments and regions is more a matter of quantifying expectations and identifying opportunities rather than rationalizing them after the forecast has been completed. In addition, we have taken into consideration the year-on-year growth to understand the predictability of the market and to identify the right growth opportunities in the global sarcopenia treatment market. The sale of vitamins, proteins, minerals, and nutritional and herbal supplements for sarcopenia treatment have surged due to the growing aging population and interest in preventive healthcare. Most of the population in the U.S., Europe, and Japan are taking supplements to stay healthy and as a cure for malnutrition-related diseases. Around 30% sale of vitamins and dietary supplement in the U.S. was to consumers aged 65 and above. Increasing adoption of supplements among the aging population due to growing health consciousness is the major factor expected to boost the demand for sarcopenia treatment and supplements. Sarcopenia is a very common disease but there are no proper treatment options available. As the prevalence of sarcopenia is high among the older population, many manufacturers are focusing on research and development of drugs to treat sarcopenia. The companies and organizations such as Nestle, Novartis, GSK, the European Working Group on Sarcopenia in Older People (EWGSOP), and International Osteoporosis Organization are particularly focusing on research and development activities and conducting clinical trials for age-related loss of muscle mass. Many pharmaceutical companies demonstrated positive clinical trial for drug development. For instance, in June 2017, Novartis AG announced the positive results of a 24-week randomized study of Bimagrumab on skeletal muscle mass and function in older adults with sarcopenia and mobility limitations. Increasing research and development activities by the manufacturer are expected to spur the opportunity for sarcopenia treatment market growth. Most of the pharmaceutical and food-processing companies are investing in the development of new nutrition supplements in order to focus on the sarcopenia treatment. Some of the companies are investing in startups and setting up a venture with the aim of investing in the early stage nutraceuticals businesses. In Feb 2016, Nestle bought a stake in Pronutria Biosciences. Nestle paid 42.3 million Swiss francs (US$ 42.5 million) for a "significant" stake in Pronutria. Pronutria is developing products to treat brain, metabolic, muscle and liver disorders. Pronutria will use the Nestlé cash to develop a new compound called PN-107, which has the potential to tackle muscle loss caused by aging, long bed rest or immobilization. These investments are expected to spur the growth of sarcopenia treatment market. The micronutrient-rich foods are being consumed in low proportions in developing and underdeveloped countries, which result in malnutrition. Malnutrition is the major cause of sarcopenia. In regions such as Latin America, Africa, and Southeast Asia the prevalence of malnutrition is very high due to poor nutritional status. Increasing malnutrition are lead to increase in sarcopenia prevalence and create high demand for sarcopenia treatment supplements. Vitamin D and Vitamin B12 deficiency are high among vegetarian and old age population which is the main cause of sarcopenia. Increasing vitamin deficiency is expected to propel the demand for sarcopenia treatment supplements. For more such actionable insights on the potential of the sarcopenia treatment market, request a free sample copy. The competition section of the sarcopenia treatment market features profiles of key players operating in the industry based on their market shares, differential strategies, product offerings marketing approaches, and company dashboard. Some of the key players featured in the report include Abbott Laboratories, Pfizer Inc., GlaxoSmithKline Plc., Nestlé S.A., Sanofi S.A., Bayer AG, Amway, Novartis AG, Cadila Healthcare Ltd., Eli Lilly and Company and other. The key manufacturers in the sarcopenia treatment market are focusing on novel marketing and sales strategies to increase their product penetration. The companies offering sarcopenia treatment supplement are focusing on online product offering and digital marketing. There is no approved treatment option available for sarcopenia treatment but nutrition and dietary supplements have a key role in sarcopenia treatment. Major Sarcopenia treatment supplement comprises of protein, amino acids, creatine, omega 3 acid, vitamin D and B12, calcium carbonate. Nutrition prevents accelerated muscle loss during a period of muscle disuse and maintains energy. PMR conducted a research study on sarcopenia treatment market for the forecast period of 2018 to 2026. The report offers a comprehensive evaluation of the business opportunities prevailing in the sarcopenia treatment market along with insights on the consumption trend, disease prevalence, awareness level, and market competition. The report elaborates on the macroeconomic factors influencing the dynamics of sarcopenia treatment market and its futuristic potential. The report offers a comprehensive taxonomy of sarcopenia treatment market based on treatment type, distribution channel and region. Based on treatment type, the global sarcopenia treatment market is segmented into protein supplement, vitamin D & calcium supplement, and vitamin B12 supplement. Based on the distribution channel, the global sarcopenia treatment market is segmented into hospital pharmacies, retail pharmacies, online pharmacies, and hypermarket & supermarket. The sarcopenia treatment market has been analyzed across regions of North America, Latin America, Europe, Asia Pacific and MEA. What is the revenue potential of sarcopenia treatment market across regions of North America and Europe? Who are the key competitors and what are their portfolios in sarcopenia treatment market? What are major challenges influencing the growth of sarcopenia treatment market? What are regularly policies for dietary supplements? Brief overview of pipeline assessment for sarcopenia treatment market. For answers to all the possible questions required for gauging the performance of the sarcopenia treatment market, get in touch with our expert analysts. The sarcopenia treatment market has been estimated based on sarcopenia prevalence pool and consumption of supplement. The market was first calculated based on sarcopenia prevalence percentage in different region/countries. The market value was estimated based on the treatment rate and consumption of different supplement in the top 20 countries globally. The primary factor of market value estimation is the daily requirement of different supplement for elderly, dosage pattern, consumption rate, weighted average prices of supplement. Other qualitative factors analyzed during the value estimation includes awareness level, adoption, and others. This information is further validated with rigorous primary research (including interviews, surveys, in-person interactions, and viewpoints of seasoned analysts) and secondary research (including verified paid sources, authentic trade journals, and resourceful databases). The research study on sarcopenia treatment market also includes top trends and macro as well as microeconomic factors shaping the sarcopenia treatment market. With this approach, the report on sarcopenia treatment market anticipates the industry attractiveness of every major segment over the forecast timespan.